We are open to touring almost everywhere — and have been out of the country! For those of you who have nothing to do or wish to study for the “Barefoot Puppets Trivial Pursuit Game,” we have a timeline below with everything you ever wanted to know about Barefoot Puppets…and then some! We have our Smithsonian debut! We finish building The Little “Bread” Hen, our first two-person show. It was a hectic build as two puppets were stolen from our studio and had to be rebuilt in the thirteenth hour. Matt Newman comes on board for the summer touring season and does an excellent job! In the fall, Matt leaves for William and Mary. Michael Bruckmueller steps in and lends his considerable talents to the company, bringing a new dimension to the show with his impressive improvisational abilities. Touring Vehicle: Dodge Van was replaced by 15-passenger van, which was smashed by a falling tree during Hurricane Isabel. This was replaced by “The Mystery Machine,” a teal Chevy Astro Van that pulled a cargo trailer full of puppets. We have had a great time touring this year and enjoyed all the Summer Reading Program shows we did for Virginia libraries. We made our international debut at Puppets Up! in Almonte, Ontario! (It’s amazing and beautiful there — go and see!) We finally finish our new website. Hope you like it! 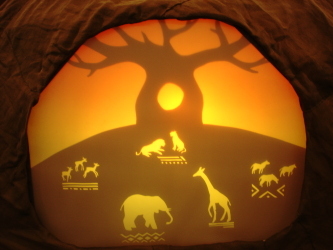 We are working on a new show…and a book for Galapagos George! More details on all that later… Touring vehicle: “Bruce,” a 2006 Dodge Truck with Cargo Trailer with ramp…know anyone looking for a bus? We had a great time touring this year and were deilighted to spend time with puppet friends in many states. Our biggest excitement was the news that we were to receive TWO grants in support of our newest show (“Little by Little,” to be developed in 2010). 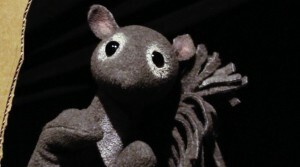 We received a grant from Puppeteers of America and from The Jim Henson Foundation. The grants will be used to fund, in part, the new show’s materials, music, and creative time. Time…what a concept! Touring vehicle: “Bruce,” a 2006 Dodge Truck with Cargo Trailer with ramp…know anyone looking for a bus? We spent the greater part of this year working on our new show, Little by Little. We planned to debut this in 2011, but the economy has not cooperated. This past year was very challenging for us. The economic crisis finally filtered down to us smaller companies as libraries, theatres, and schools saw their budgets ravaged by cutbacks. We knew it was coming — but we didn’t expect it to be as bad as it really was. We are happy to report that 2011 is looking better already and are hopeful for the future — what else can we be? Touring vehicle: “Bruce,” a 2006 Dodge Truck with Cargo Trailer with ramp…know anyone looking for a bus? We take a deep breath and keep moving along! 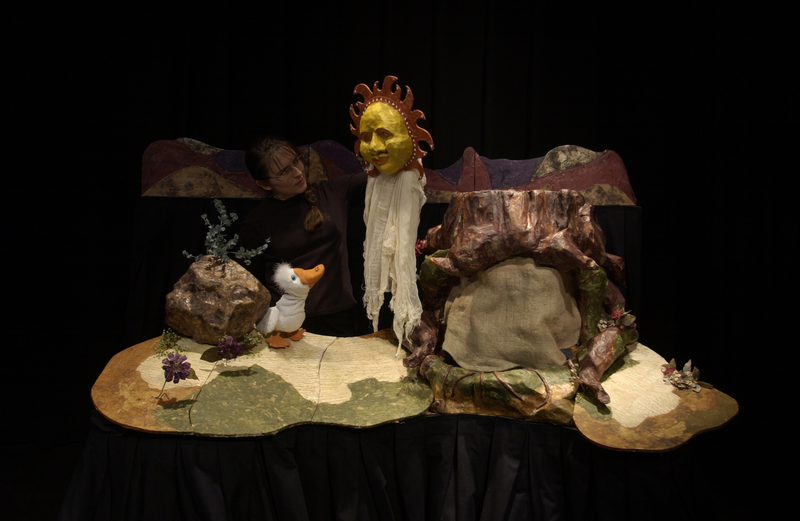 The most amazing thing happened in 2012: Heidi Rugg went to the National Puppetry Conference at the Eugene O’Neill Center for Theatre in Waterford, Connecticut. Overwhelmed by technical difficulties, she takes her work-in-progress to the O’Neill to troubleshoot some of the issues she is having with certain sequences in the show. It’s a life-changing experience to be around so many amazing and talented puppet artists from all over the country. She works with a great team of people to solve all her problems with a 20-ounce bottle of Deer Park Water and Sharpies. (You’ll see the amazing results when the show opens!) Touring Vehicle: “Joey” the Suburban with Travel Trailer. Well, we took a break from building “Little by Little” to build a new show, “Ooey Gooey Poetry.” It’s a fun piece that is also a bit silly. Heidi returned to the O’Neill Conference again, but this time as a member of “Resident Company,” so she could help another artist create a new work. 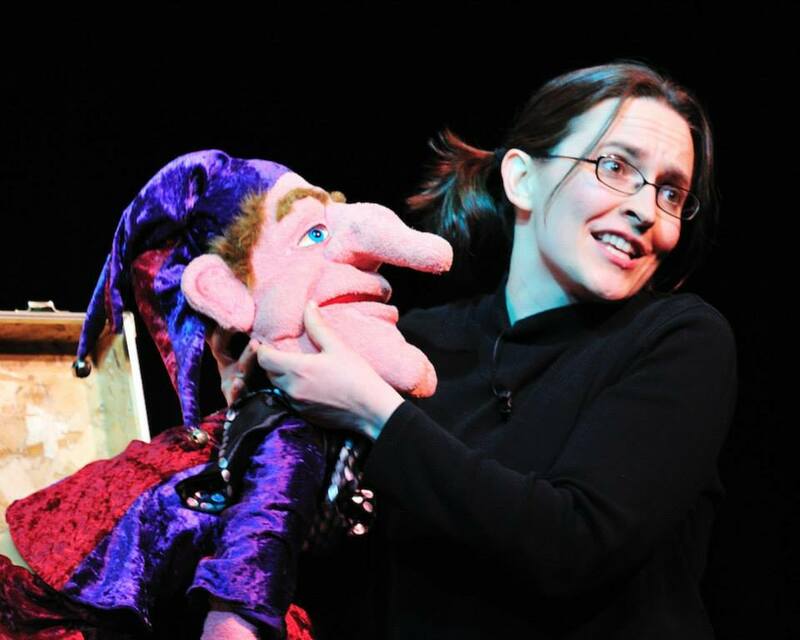 She works with Amy Rush and a team of other talented performers to put together a large-scale puppet saga and battle on the beautiful grounds of the O’Neill in Waterford, Connecticut. Touring Vehicle: “Joey” the Suburban with Travel Trailer. Our big project this year was filming all of our shows! We look forward to having the edited clips available on our website soon! So excited to be part of Puppets Off Broad Street in Richmond as a Resident Company Artist. Touring Vehicle: “Joey” the Suburban with Travel Trailer. Well, Heidi is learning all about wet-felting. Out of a concern for the toxic nature of so many materials used in puppet building, Heidi is re-thinking how she makes all of her puppets. It’s kind of like reinventing the wheel, but in a good way. Heidi also launched “The Naked Puppet Exhibit” at the National Puppetry Festival. Touring Vehicle: “Joey” the Suburban with Travel Trailer. 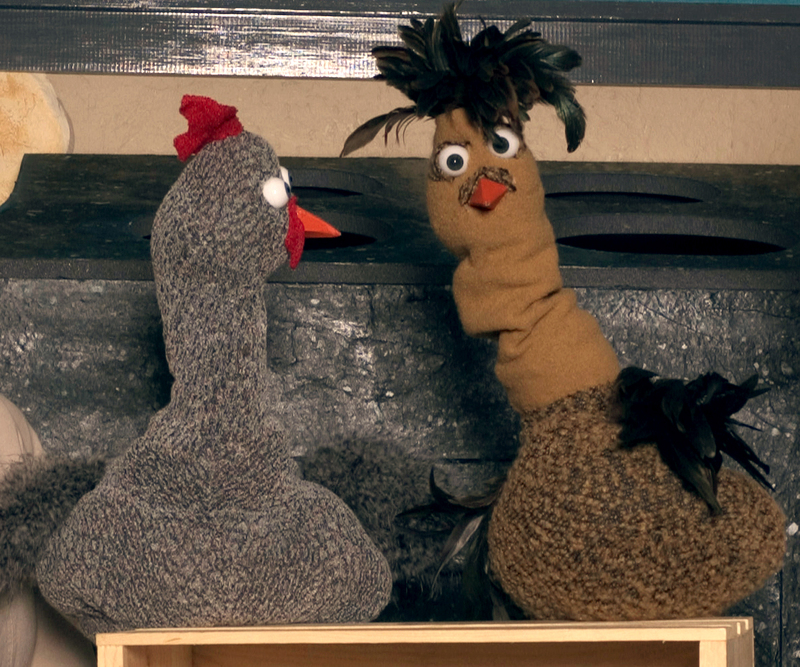 We create a new show for very young children called “Run, Run As Fast As You Can!” This show features rod puppets and object puppets. It’s VERY lively and VERY interactive with lots of opportunities to baaa, cluck, and moo! We are still working on finishing up “Little by Little.” (And, little by little, it will someday be finished! Touring Vehicle: “Joey” the Suburban with Travel Trailer. Time flies! This year we celebrate 20 years of touring our shows and sharing workshops. We are incredibly grateful to do what we LOVE. 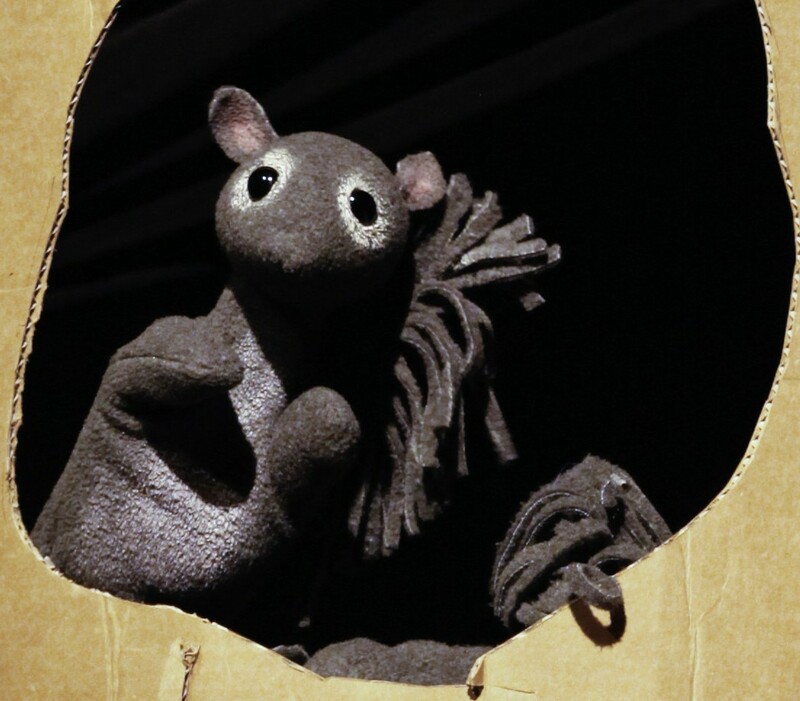 We are excited about upcoming adventures in the next twenty years — starting with a collaboration with 5th Wall Theatre and TheatreLab’s production of “Hand to God” next summer. Touring Vehicle: “Joey” the Suburban with Travel Trailer.